Energy Star Electrical Devices – Should You Invest On Them? Home/Energy Efficient/Energy Star Electrical Devices – Should You Invest On Them? As the energy costs go higher, it has become imperative that a serious thought is given on energy saving appliances. While going in for energy saving appliances, either you are buying for the first time or planning to replace your existing appliance which is outdated, it would be advisable to confirm that the brand you are going in for meets with international standards. With Energy Star in market, one need not look further as it is of international standard in the world of energy efficient equipment. Ever since the US Environmental Protection Agency created it, to be precise since 1992, several countries, with U.S. and Australia included, are using it. You might have come across other similar labels such as EU Energy Label and the UK Energy saving Recommended Label. As all the countries realize the importance of energy saving methods, Governments are joining hands with national energy saving programmes so that the energy saving equipment are put to use both at home and in business. Let’s have an idea of how energy saving equipment function. By automatically switching the equipment into a ‘sleep’ mode when unused and switching to ‘standby’ mode the device effectively reduces the power consumption. With an improved technology we see that most of the office equipment are potentially capable of saving energy this way, but not all machines, to be particular, PCs are enabled to saving energy in this manner. You may request your IT or maintenance staff to assist you in this regard. However, if you go in for Energy Star Home electronics products you could be assured that you are saved the trouble as they have energy saving features inbuilt. When compared to standard products, your TV, VCR or DVD if they are of Energy Star standard, will significantly reduce energy consumption as it will consume around 75% less energy in standby mode. When an electrical appliance is switched off or not performing its primary function and if it is consuming electricity, it is termed as ‘standby’ power. It is considered as leakage, sometimes termed as vampire or phantom electricity. The problem could be avoided with Energy Star standard as if your electronic gadgets comply with Energy Star standard, you can be assured that it will automatically switch off into a power saving sleep mode after a given time. Where computer is concerned, you could see that the monitor goes dark and as far as the components are concerned, like the hard disk and main processor, two thirds of the power used will be reduced automatically. It is for you to choose the time the equipment is going to take to ‘go to sleep’. On pressing a key or moving your mouse you can wake up your computer from sleep and start working on it. It is as simple as that. Well, it is a known fact that the best way to affirm that when idle an equipment does not consume electricity will be to turn it off at the power point which would also save you money and very much reduce fire hazards. The proportion of standby power is an overwhelming 12% of household electricity consumption in developed countries. 5 megatonnes of Greenhouse gas emissions are let out annually in Australia which is due to standby power costing consumers around 500 dollar million every year. According to statistics taken, 1% of global greenhouse emissions is due to standby power. This is due to malfunctioning of energy used by products on standby. For features such as internal clock, activation of remote control and maintaining memory, minimal amount is needed. However, most of the standby power is only wasted energy. To cut down on the waste it would be advisable to go in for Energy Star or products that are similarly enabled to deal with energy saving. Before you install a home solar power system, it is best you upgrade the old electrical devices into Energy Star product. There is no point trying to supplement your home energy use with solar power when your electrical equipment are not energy efficient. If you need help to build your own Photovoltaic (PV) panel on a limited budget, check out the Power4Home program by John Russel. Read up on the Power4Home review on this blog to understand what the program has to offer. Do you know what an Energy Guide is? Energy Guide provides you all information about the amount of electricity consumed by a particular appliance in a year. Law requires energy guide to be attached on every appliance set for sale in the market. The bar scale on it represents the variety of efficiency of similar appliances. It will also give you some idea about the level of efficiency of the product. Another thing to search for is the energy star ratings. Energy star ratings is an international standard for energy-efficient products. The ratings can vary from a single star to several stars. 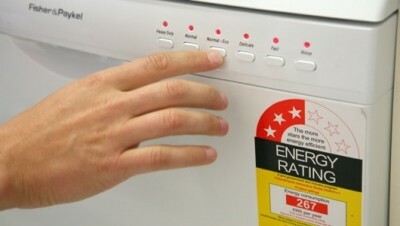 Higher the number of stars, the more efficient the appliance is.